One of my friends with whom I regularly cook, has an almost three-year old son who loves to play in the kitchen. 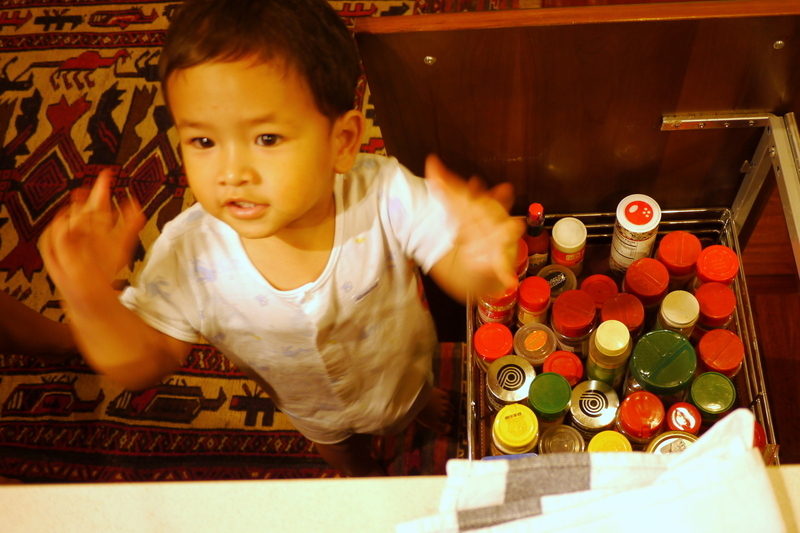 A favorite activity is to open the spice drawer and pull out each individual jar and pretend to pour it onto the stove. This was great fun until the lid of white pepper came off and spilled all over. Later, he sat with Uncle Tawn, using a pair of tongs to pick up appetizers and move them from pull to another. All fun and games until I caught him picking up a spear of asparagus, briefly chewing the end of it, and then putting it back on the platter! I’m glad he enjoys cooking so much, though. When he grows up to be a famous chef, we’ll be able to say that we knew he was destined for the kitchen, even when he was just a little fellow. How about you? Were you welcome in the kitchen when you were a child? I remember being in the kitchen “helping” when I was no older than kindergarten and I was scrambling my own eggs by six or seven years old. This entry was posted in Uncategorized and tagged children, cooking, food, kitchen by christao408. Bookmark the permalink. Love the photos – you have two photo stars there. I was never allowed in the kitchen. That was my mother’s kingdom! We entered to eat and with permission get a snack from the frig. I “learned” to cook when I went to college. And continued to experiment in the kitchen ever since. hahaha cute. my mom definitely brought my sister and i in the kitchen… she insisted that we learn how to cook and bake so we could survive on our own (and, i think, so she would have some help in the kitchen!). i don’t remember what age i was when i first started “helping,” though. Awww…. I think I was about 8 when I helped stir sauces and washed the dishes (I just wanted to spray water everywhere). I helped make brownies and cookies. I do a lot of overnight slow cooker meals and make my best friend, my husband, yummy diabetic crock pot meals.That little boy is absolutely adorable and is blessed to be surrounded by folks like Tawn and you, who are patient and willing to teach him,:)Have a good Tuesday. No Chris, I never saw the inside of our kitchen. We could never step into that part of the house. I learned every thing here in the US, by making mistakes, and correcting them. If someone had taken the trouble to teach me something then, I would have been a better cook.I can see the positive influence you had as a child. The child is delightful but I’m wondering why he would even put asparagus in his mouth! Yech! By third grade I was a master of the omlet. We didn’t cook dinner but my sisters and I were given free rein to make breakfasts. We did hot cereals, eggs in all forms and even bacon… Some would say my education was lacking at a young age because I never learned to brew coffee. Can’t let this post pass without adding a few comments. When you started school, I let you prepare your own breakfast on Saturday morning so Dad and I could sleep in an extra hour or so. That preparation included getting out your cereal and pouring it into the bowl, then taking the milk I’d poured into a child-size pitcher and pouring it over your cereal. I think you probably prepared your sister’s as well. That was the earliest I remember about your working on your own in the kitchen. The scrambled eggs probably came pretty quickly after that. As soon as you and Jennifer were able to stand on a sturdy chair at the counter, you would help with stirring, measuring, even using the mixer, but no sharp knives or working at the stove until much later. At about age 3, you decided you wanted to taste the beaters of the hand mixer which had whipped cream or meringue on them and got a bit of surprise. Since the mixer was still plugged in, you got a little buzz on your wet tongue. Not at all what you expected. All that sounds so familiar. I stumbled on this from the xanga front page and couldn’t agree more! I was a ‘skirt clinger’ as a child, so my mom tells me she ‘had to’ find things for me to do so I wouldn’t be annoying…so I was cutting eggs or cooked veggies with a dull/butter knife at like 3. I remember baking a cake at 7 (with advice/help but it was my project), and undertaking dishes/meals from a cookbook at around 9 or 10. Obviously by then I was an old hat at pasta, hot dogs, eggs, cutting veggies for salad, etc. My sisters were more independent when they were really young, so I don’t think they started learning their way around the kitchen until they were 5 or 6, but now they can both feed themselves (aged 16 and 19), and one is a stellar baker to boot :)The concept of not being able to cook *at all* besides sticking things in the microwave is so foreign to me! And it seems cruel to send a child out in the world without the rudiments of boiling, frying, and baking! @jandsschultz – Ah, thank you for clarifying the record regarding my early age cooking activities! @mismatched_hats – Interesting, so early childhood involvement in the kitchen was not an indicator of future cooking success, huh? @galliver – Thanks for stopping by and sharing your story. I agree, teaching a child to cook is an important thing. If we don’t know how to cook, we end up developing generally poorer eating habits as an adult. @murisopsis – Yes, you were terribly shortchanged for not having learned to brew coffee at an early age. Your mother seems like such a nice person – how could she have let such an oversight happen? Ha ha…@ZSA_MD – For the life of me, I cannot believe that your incredible talent in the kitchen does not have its roots in childhood kitchenwork. You are very well self-taught, then! @iskrak – He wants to keep playing with the microplane blades – a definite “hands-off” item, literally if not figuratively. 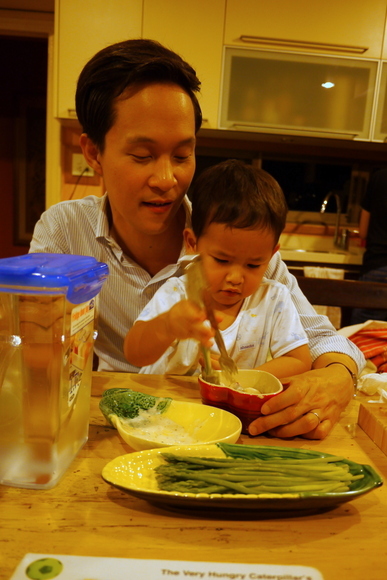 @Grannys_Place – One of the things I miss here in Thailand is slow cooker meals. The weather just isn’t conducive to nice, warm stews and long simmered cuts of meat. @Fatcat723 – A willingness to experiment, a lack of fear of failure, is a good thing to have in the kitchen. We don’t see any pictures of your cooking, though! @ElusiveWords – I’m sure you were a tremendous saucier! @beowulf222 – This is the same one, yes. @kunhuo42 – Three cheers for your mother and her wisdom! @RestlessButterfly – Isn’t that a TV show already? @Inciteful – Does it? Were you in the kitchen from an early age? @christao408 – To make a short story shorter, yes. when i was little, the kitchen is almost always the one place in my home where one is not welcomed to hang around at, for one will always be considered to be “in the way”. with a kitchen the size of a walk-in closet, my two late grandmas constantly busy moving around, cleavers always on a chopping board, and with all counter-top gas stoves on, that place is constantly hot and dangerous for a non-adult to wonder. i did, however, from time to time, tried to steal a moment or two to just stand at a close distant and watched them work. the amount of sweat, body movements, and smells of a hundred different ingredients all rolled into one, always managed to capture my attention, got me salivating, and made me appreciate more of what went on into the preparation of food. many fond memories come flooding my mind whenever i encounter a specific smell that can be associated with my grandmas’ cooking.